At the invitation of the government of the Republic of Kenya, State Councilor Wang Yong will visit Kenya as the Special Envoy of Present Xi Jinping and attend the completion ceremony of the Mombasa-Nairobi Railway from 30 May to 1 June. Kenya has been listed as a pilot and demonstration country of China-Africa cooperation in production capacity. In recent years, with stronger mutual political trust, the two countries practical cooperation in various fields have spearheaded China-Africa cooperation. As the flagship project for China-Kenya pragmatic cooperation, Mombasa-Nairobi Railway will be officially completed and put into operation on 31 May. China has always attached great importance to developing the relations with Kenya. We wish to work with Kenya, taking the opportunity of the implementation of the FOCCA Johannesburg summit's outcomes as the main line and the advancing the Belt and Road Initiative and production cooperation as the focal point, to comprehensively strengthen across-the-board mutually beneficial cooperation and scale bilateral relations to a new height. At the invitation of the government of the Republic of Niger, the Republic of Angola and the Republic of Zambia, State Councilor Wang Yong will visit these three countries from 1 to 9 June. China, Niger, Angola and Zambia are good friends and partners with equality, mutual benefit and win-win outcomes. In recent years, China's relations with the three countries have maintained a sound momentum of development with deepening mutual political trust, productive mutually beneficial cooperation and good communication and cooperation in international affairs. China attaches great importance to developing the relations with the three countries and wish to, while taking the implementation of the Johannesburg summit's outcomes as an opportunity, jointly deepen the cooperation in various fields and bring more benefit to Chinese and African peoples. Q: The US Acting Assistant Secretary for East Asian and Pacific Affairs Susan Thornton made remarks in Beijing that China has recognized the urgency of pressurizing the DPRK and remains open to further sanctions on the DPRK. In addition, Chinese officials have told her that China has tightened control on the border with the DPRK. Can you confirm that? If this is true, what message does China send to the DPRK? A: I believe you must be very clear about China's stance on the Korean Peninsula nuclear issue. We stay committed to the goal of denuclearization, upholding peace and stability on the peninsula and resolving the issue through peaceful means of dialogue and negotiation. On the measures by the Chinese side, it is safe to say that, as a permanent member of the Security Council and a country that has major stakes in the peace and stability of the Northeast Asia, China strictly implements the DPRK-related resolutions adopted by the Security Council, and we have always maintained that all relevant countries should fully, strictly and accurately implement the resolutions. We believe the US side, including Ms. Thornton must be very clear about that. Q: Susan Thornton also said that China was aware that there was limited time to solve the DPRK situation through talks and that there was less time than expected to get the DPRK to the negotiating table. Do you have a comment on that aspect of her remarks? A: China's long-held stance is that continuous tensions on the Korean Peninsula and the failure of various parties to return to the negotiating table as soon as possible are not conducive to solving the Korean Peninsula nuclear issue and regional peace and stability. That is why we have always maintained that relevant parties should demonstrate flexibility to work in the same direction, come back to the negotiating table as soon as possible and make joint efforts for the early resumption of six-party talks and peaceful solution of the Korean Peninsula nuclear issue. Q: According to reports by the Economic Times of India, the Indian government will soon introduce a policy to bar Chinese companies from investment in power sector projects. Would you like to comment when 300 million people still have no access to electricity in India? A: I will not make comments on the situation of power in India. I would like to say that the trade and economic cooperation between China and India should be mutually beneficial with win-win results in nature, which will also bring tangible benefits to the two peoples. We think the deeper cooperation in various fields between China and India, including the growth of two-way investment, will be beneficial to the two peoples. Q: The Dalai Lama has given an interview to the Indian Express in which he talked about the possibility of his successor especially through the reincarnation process, in which he said that the Chinese Communist Party should first accept the concept of rebirth and reincarnation, then they will have moral connections to the Dalai Lama's reincarnation. What exactly is China's policy towards the reincarnation process and the successor to the Dalai Lama? A: On the issue of the reincarnation of the Living Buddha in the Tibetan Buddhism, including the reincarnation of the fourteenth Dalai Lama, the relevant authority of the Chinese government has introduced the relevant conditions and management for many times. The Dalai Lama himself is also clear about this. The title of "Dalai Lama" itself is granted by China's central government, and the enthronement of the fourteenth Dalai Lama was hosted by the representative of the then government of the Republic of China. The reincarnation of the Dalai Lama and the system of reincarnation, including the lot-drawing from a gold urn, have established and complete religious rituals, historical conventions, laws and regulations, which cannot be decided by anyone willingly. Q: As for the missing Indian Air Force Sukhoi-30 jet and the two pilots on board in the eastern section of the China-India border, does China have any new information? Will China come forward to help India with the search and rescue? A: I responded to this question the day before yesterday and also reaffirmed China's long-held position on the issue of the eastern section of the China-India border. Up to now we have no further information on this and have not been asked by India for assistance in the search work. Indeed, if India has such a need and requests us to do so, we will provide assistance within our capacity out of humanitarian consideration. Q: We just received report that the wreckage of the missing plane has been found close to the China-India border, but the fate of the two pilots is not known. If there is request from the Indian side, is China open to help locate the pilots? A: First of all, I am not aware of what you said. Just as I said, we have not received any request from the Indian side by far. We will provide assistance within our capacity out of humanitarian consideration at the request of India. 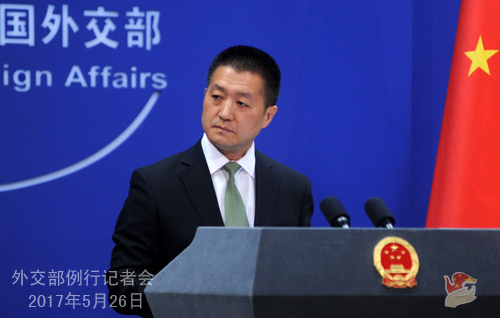 Indeed, as I said the day before yesterday, whatever China does will not affect its principled stance on the issue of the eastern section of the China-India border. 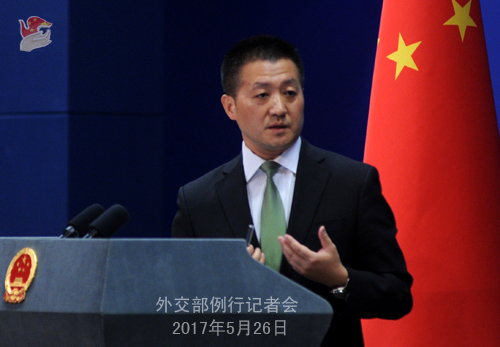 The Foreign Ministry will hold a briefing at Lanting at 3:00 p.m. on Saturday, 27 May, during which Vice Foreign Minister Wang Chao and Assistant Minister of Commerce Li Chenggang will introduce Premier Li Keqiang's visit to Germany and meeting with German Chancellor as well as his visit to Belgium and attendance in the 19th China-EU Summit in Brussels, and answer questions. You are welcome to this briefing. 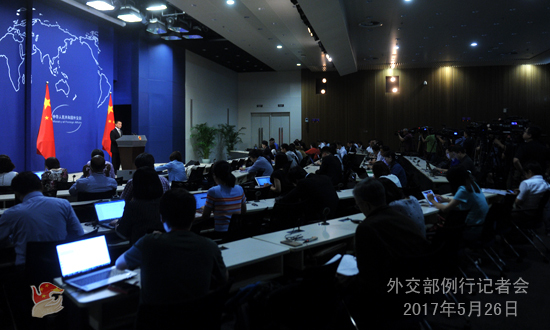 The Regular Press Conference of the Foreign Ministry will be adjourned from Monday, May 29 for the Dragon Boat Festival and resumed on Wednesday, May 31. During the adjournment, the Spokesperson's Office will take your questions by phone and fax as usual.